...GET IT SHIPPED Free Auto Shipping Quote: 1970 Chevrolet Impala all orig. parts one owner clear title engine is 350 t power glide trans. 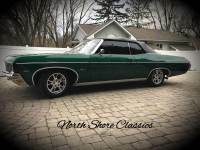 ...GET IT SHIPPED Free Auto Shipping Quote: 1970 Chevrolet Impala Original. Rust free 3rd owner car.This car is a daily driver and runs great. ...GET IT SHIPPED Free Auto Shipping Quote: 1970 Chevrolet Impala Project car 350 350 run needs front floor pan.